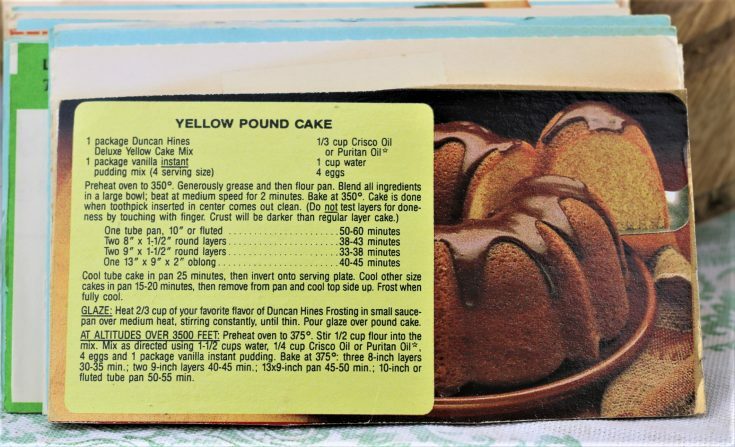 Front of the recipe card for Yellow Pound Cake Recipe. 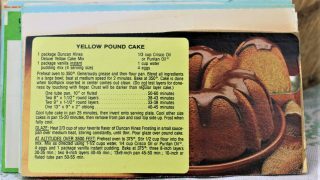 There are lots of fun recipes to read in the box this recipe for Yellow Pound Cake Recipe was with. Use the links below to view other recipes similar to this Yellow Pound Cake recipe. If you make this Yellow Pound Cake recipe, please share your photos and comments below! Generously grease and then flour pan. Blend all ingredients in a large bowl; beat at medium speed for 2 minutes. Cake is done when toothpick inserted in center comes out clean. Do not test layers for doneness by touching with finger. Crust will be darker than regular layer cake. Cool tube cak ein pan 25 minutes, then invert onto serving plate. Cool other size cakes in pan 14-20 minutes, then remove from pan and cool top side up. Heat 2/3 cup of your favorite flavor of Duncan Hines Frosting in small sauce-pan over medium heat, stirring constantly, until thin. Pour glaze over pound cake. AT ALTITUDES OVER 3500 FEET: Preheat oven to 375°. Stir ½ cup flour into the mix. Mix as directed using 1-½ cups wter, ¼ cup Crisco Oil or Puritan Oil*, 4 eggs and 1 package vanilla instant pudding. Bake at 375°: three 7-inch layers 30-35 min. ; two 9-inch layers 40-45 min. ; 13x9-inch pan 45-50 min. ; 10-inch or fluted tube pan 50-55 min.